Willow Town is a fun-filled, action packed adventure series of whacky animal friends! Somewhere in central England is a small village called Willow Town. It is surrounded by green fields and woods, with a gentle river flowing right beside it. The town itself has the appearance of the early twentieth century, with railroads and horse drawn carraiges as the only means of local transportation. Life along the riverbank is plentiful for Ratty the Water Rat and his shy friend Mollie the Mole, who together, enjoy boating and picnicking on the calm waters of the Grahame River. Beyond Willow town, Gaul the Toad lives in a large mansion known as "Toad Hall." He is constantly getting himself into situations that require the help of his two friends. Together these three animal friends help keep Willow Town out of the clutches of the villians that wish to take it over. Bully the Weasel and Scurry the Ermine live in Wild Wood, the dark forest outside of Willow Town. Both Bully and Scurry will try every trick to get Willow Town for themselves. 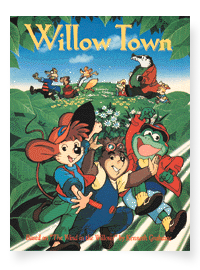 However, our heroes, with the help of their other animal friends, are able to overcome any attempt to take Willow Town. Produced by: Enoki Films Co., Ltd.